Practically the same thing applies when a gob fire is being built off. Men working on the return side are exposed to gases such as carbon monoxide, sulphuretted hydrogen and sulphur dioxide. Often they are only able to work a few minutes when they have to get in fresh air to recover before going in again. The result is that either a large number of men have to be used to keep the work going continuously or if only a few men are engaged, there is the danger of their being overcome and in any case, as a result, their health is likely to suffer. The writer is of the opinion that in such operations rescue apparatus is always handy, even though there is no necessity to use it. If the atmosphere is such that the men are affected, even slightly, the apparatus should be worn during the building off. If the air was good, the apparatus should be lying by, as sometimes a slight explosion occurs and a quantity of carbon monoxide drifts into the return airway with fatal results to the men working there. In such cases with the apparatus available, there should be sufficient time in most cases for the men to slip them on and protect themselves from the afterdamp. In the majority of cases where only a little gas is present, the work would be done much more quickly by properly equipped men than by unprotected men, alternating working and resting for a few minutes to recover in fresh air. Expense may be urged against such procedure but what is expense, compared with the practical elimination of fatal accidents and speed, which is a great consideration. Several cases during late years have occurred where men have been killed by afterdamp on the return side of a gob fire, but only when unprotected from gas. There is doubtless much scope for the apparatus in such cases and more use might be made of it than at present, if only as a precautionary measure. 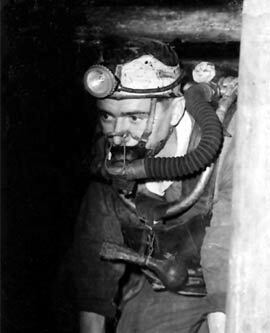 With regard to the actual rescue of human lives by the use of breathing apparatus, sometimes a fire breaks out at the bottom of the downcast shaft, spreading rapidly and pouring smoke into the workings. The men working on the roads rush for safety into the workings, and, as a result, generally all the men in the pit loose their lives. In most collieries the upcast and downcast are a short distance from each other, with two or more separating doors between; and if, in the case of a fire, these doors could be immediately opened, the smoke would be short circuited, into the upcast, leaving the air in other parts of the workings clear. On this air the men could live for a long time, and if the fire could be quickly extinguished they would soon be set at liberty. If it continued burning for several days rescue men with spare apparatus would be able to descend the upcast shaft, travel through the smoke and reach the imprisoned men. These men could be fitted with the spare apparatus and piloted by the rescue teams to be brought out safely. If this course was not practicable, food and water could be taken down to them, as they could live several days in the air of the workings, until the fire was extinguished. In several cases of this description it has been found that if the men or even one of them, had the presence of mind to open the separation doors between the shafts, their lives would have been saved. It would be advisable, if the men or at any rate, a few of them, particularly those working round the pit bottom, were instructed what to do in case of fire at the pit bottom, and to do it quickly. Where the doors have been opened in similar circumstances lives have been saved, and the writer has no knowledge of any harm resulting. Upwards of 20 years ago an explosion happened at the downcast pit bottom of the Thornhill colliery, near Wakefield through accumulated gas from old workings penetrating into the pit bottom, where naked lights were used. The men in the outlying districts were unaware of any accident for several hours, and when they discovered the trouble, they were unable to come out, because of the afterdamp. In something like 24 hours the roads were cleared, and the rescue parties, without breathing apparatus, which, of course, was not then in use, were able to reach the workings. They found some bodies and eventually reached men who were still alive. These men had kept themselves alive by pushing wagons backwards and forwards, and were able to give particulars as to how and when their comrades had died. Surely, if rescue apparatus had been available these men could have been reached, and, with the aid of spare apparatus, a large proportion of the men could have been saved. Such a case could happen anytime in the future. 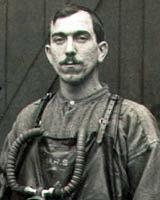 Regarding the apparatus itself, the Proto breathing apparatus is designed to last for a minimum period of two hours hard work, during which time the wearer is independent of any outside aid to breathing. For this reason it is known as a self-contained apparatus, different from a diver's equipment as the latter is dependent on air pumped to him from the surface. The principle on which it works is that the wearer breaths the same air repeatedly; at each exhalation the air is purified, and immediately before inhaling a little oxygen is added to the purified exhaled air, to take the place of the oxygen absorbed into the body at the previous breath. Ordinary air contains approximately 79 parts of nitrogen and 21 of oxygen. When this mixture is taken into the lungs, the blood absorbs as much oxygen as it requires for the upkeep of the body. In hard work, about four parts of oxygen are absorbed, the amount decreasing as the work lessens. For explanation of the apparatus, we will say that hard work is being done, and four parts of oxygen are absorbed from each breath. The blood gives off, on exhaling four parts of carbon dioxides, which is a harmful gas. Nitrogen is an inert gas, none of which is absorbed by the body its purpose being merely to dilute the oxygen and it is breathed out in exactly the same condition as inhaled. The exhaled air then is composed of nitrogen 79 parts, oxygen 17 parts and carbon dioxide 4 parts.The only difference between exhaled and inhaled air is that in the former a little carbon dioxide has taken the place of a little oxygen. What is required then in a breathing apparatus, is a device by which, after each breath the carbon dioxide is extracted and fresh oxygen to compensate for the amount used is added before the mixture is breathed again. Most types of breathing apparatus act on this principle. 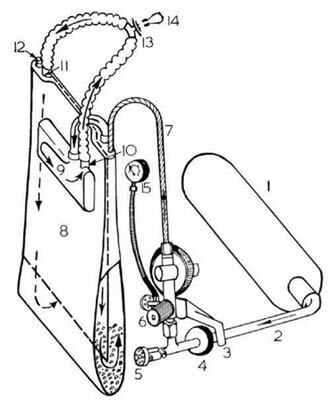 With regards to the circulation of the air in the apparatus, suppose a man is wearing it and is at the moment exhaling the air breathed out passes down the exhaling tube through a mica valve which fails to open into the outer part of the rubber breathing bag. The breathing bag is divided into two parts by a curtain or diaphragm, which is cut off about two inches from the bottom. Sticks of caustic soda occupy the space at the bottom of the bag. The exhaled air passes over the caustic soda, which absorbs the carbon dioxide, leaving the oxygen remaining and the nitrogen to pass into the inner compartment of the bag. The mixture travels upwards to the bag, where a slight stream of pure oxygen from the cylinder joins it carried on the back. The addition of the oxygen brings the purified exhaled air up to almost the same mixture as ordinary good air and it is then inhaled through the inhaling valve tube and mouthpiece. The mouthpiece is shaped to fit the mouth very closely and a clip closes the nose.